Most of you would know of my love for candles. There is nothing like a candle glowing softly on a cosy dark evening. Not only are candles comforting, but they also enhance the ambience and make the home smell gorgeous. Sitting here in Enfield, I can be transported to a tropical beach by lighting a coconut scented candle ;-) Scents are excellent memory triggers and that is why I enjoy scented candles a lot and keep exploring new brands. And the brand that I bring to you today is - Shearer Candles. Set in the outskirts of Glasgow, Shearer Candles has been in business since 1897. Whether you want jar candles or tin candles, pillar candles or special occasion candles or even diffusers and candle holders, you will find a large and excellent selection of products on Shearer's website. And the best bit is that all products are reasonably priced. 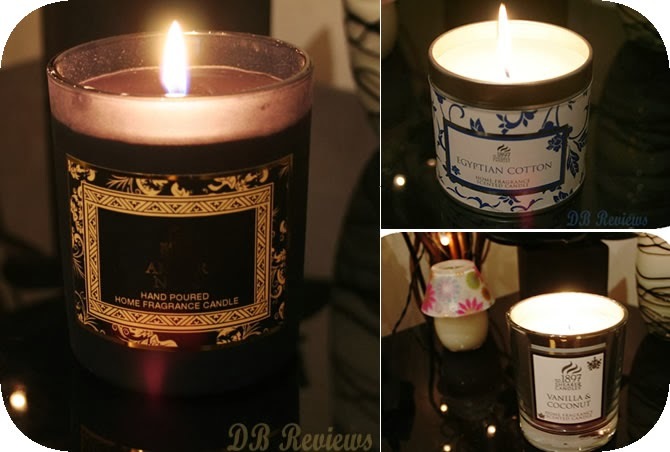 I tried out 3 candles from Shearer Candles and here are my views on them. The Amber Noir Jar Candle(£7.00) is one of their best sellers and has a burn time of 35 hours. I absolutely fell in love with the design and the fragrance. The black coloured jar with gold text is a lovely decorative piece on its own. The fragrance is gorgeous - an exotic blend of tuberose, violets and amber. It made the house smell so wonderful. If you love classy fragrances, then this hand poured Amber Noir candle is for you. The tin candles from Shearer Candles are lovely. They are a perfect size for travel. You can easily carry it with you on your travels and the lid keeps the scent locked in. The fragrance range is amazing. You will find scents as diverse as Hollyberry and Clove to Watermelon and Persian Lime. I tried Egyptian Cotton(£7.00) which has sweet floral notes of rose, jasmine and carnations with just the perfect touch of clove. What a lovely fragrance! With a burn time of around 40 hours, this one is perfect for use in the kitchen or while travelling. I am a fan of anything with Coconut in it and the Vanilla and Coconut Silver Jar Candle(£12.00) from Shearer Candles is no exception. It is a lovely blend of Vanilla and Coconut. The silver jar is so darn beautiful; I spent the first five minutes just admiring the jar. The silver mirror jar is stunning and gorgeous to say the least. And need I say about the fragrance - its warm, sweet and heavenly. A taste of tropical paradise. Love it. Do you love candles? What is your favourite candle scent? Have you experienced Shearer Candles? Love! I've been wanting to get a few new candles for my apartment! I am sure you will find something to your liking on Shearer's website. Never tried those, I love the citrus fragrances. These look lovely. Those candles look absolutely beautiful and I am sure, they smell fantastic too! Shame I am not allowed to burn them in the house due to renting. Might think of them as presents. Its a shame you are not allowed to burn candles in your rented home. But yes, these would make lovely gifts as well. Hey everyone. We love the Shearer Candles too, especially Amber Noir. If you enter the code WELCOME on our website (http://www.candlesathome.co.uk), we'll give you 10% off and ship them for free too!